After decades of under-supply, the Chittenden County apartment market has experienced a boom in new construction over the past five years. Since 2014, an average of 461 new apartments were built per year, which is three times the average annual growth rate between 2000 and 2010. Two years of record-breaking growth occurred in 2015 and 2016, when over 1,200 new units were built. To readers who reside in more densely populated markets, these numbers may seem small; however, the proportionate share of new apartments among the total market inventory is significant. 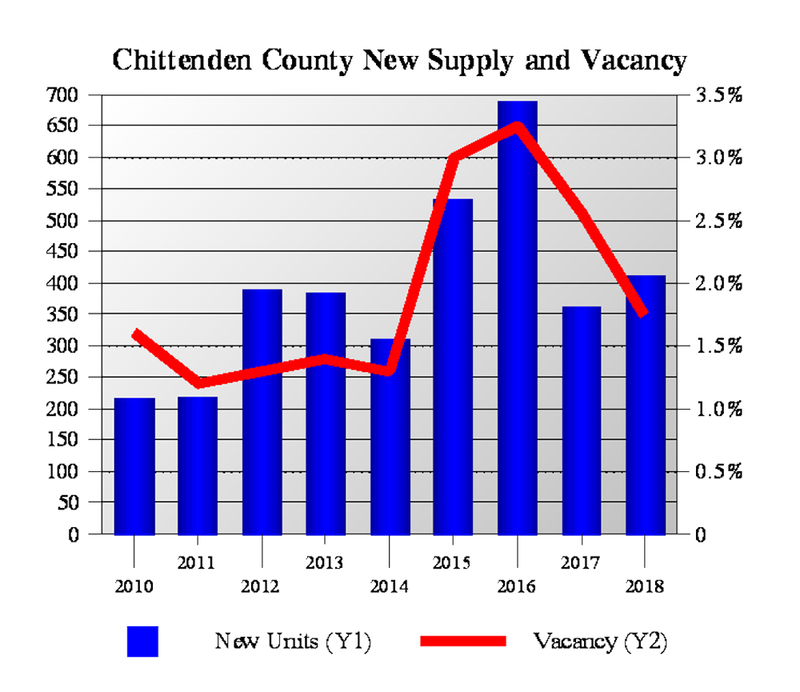 As an illustration, U.S. Census data indicates approximately 26,000± renter-occupied housing units in Chittenden County, and new growth in 2015 and 2016 alone represents about 4.7% of that figure. We are expecting two more years of aggressive growth in 2019 and 2020, with over 600 units planned this year, and at least 650 units slated for next year. Most of the development will take place in Burlington and South Burlington. These two cities account for roughly two thirds of the growth in 2019 and half of the growth in 2020. Interestingly, the apartment market is expanding at a rate that surpasses population growth. Chittenden County has exhibited slowing population growth over the past few decades. Decennial Census data indicates average annual population growth of 1.12% per year between 1990 and 2000, 0.68% per year between 2000 and 2010, and 0.63% per year between 2010 and 2015. The Chittenden County Regional Planning Commission projects annual average growth rates of 0.54% per year between 2015 and 2020 and 0.46% per year between 2020 and 2025. The 25 to 34 age cohort is characterized by renters who are beginning their careers and saving for their first home purchase. Affordability poses a significant change for millennials in the Chittenden County market. Over the past decade, median household incomes have risen at a rate of 1.3% per year, while rent inflation has averaged 2.9% per year, and median home prices have increased by an average of 3.2% per year. These factors, combined with young persons’ preferences for mobility and freedom, have kept many younger adults in the rental market. 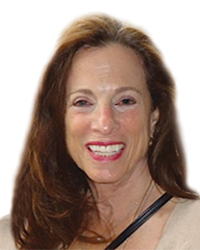 The baby boomer generation also reflects a growing segment of the population. This cohort has begun to downsize out of single family homes and is a source of demand for high end apartments and age-restricted rentals. Over the past decade, home ownership in Chittenden County has been relatively flat, while the prevalence of renter-occupied housing units has grown considerably. According to data published by the U.S. Census Bureau, the estimated number of owner-occupied housing units in the county has fluctuated between 39,290 and 41,208, with no identifiable pattern of growth. Over the same time period, the proportion of renter-occupied housing units has grown from 31.1% to 39.6%. This trend reflects a larger share of the housing market choosing to rent instead of own. This has coincided with a gradual shrinking of the average household size in the local market. 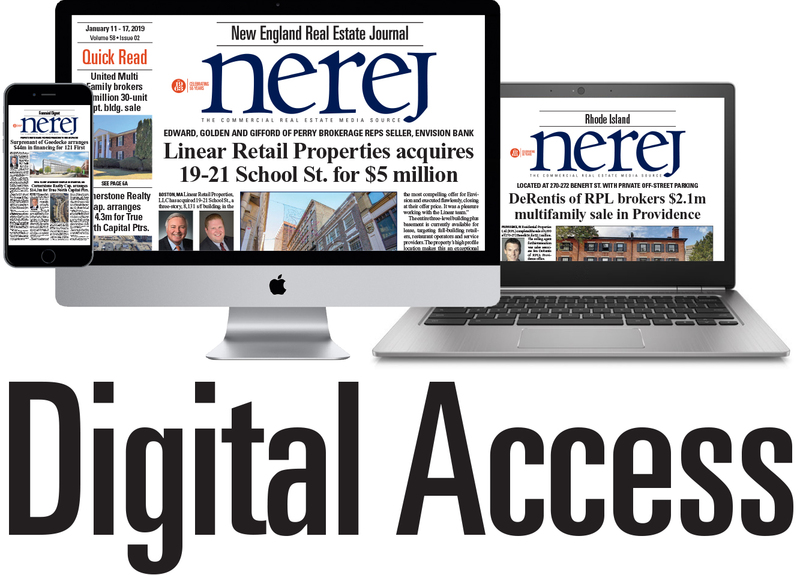 Beyond 2020, there are numerous significant projects which could continue the current growth trend for the Chittenden County apartment market. Two large multi-phase suburban projects in South Burlington and Essex account for roughly 550 units, and are in the final stages of permitting. The most significant future project is CityPlace Burlington, a mixed-use urban redevelopment at the former site of a five-acre downtown shopping mall. This 14-story project is approved for 288 apartment units, 127,000 SF of retail, 230,000 SF of office, and a 939-space parking garage. Demolition of the former mall is complete; however, CityPlace Burlington has been delayed for numerous reasons, and the site has been dormant since August. Recent public comments from controlling partner, Brookfield Asset Management suggests that construction is expected to resume this spring. This project will have a significant impact on the local market, if constructed as currently envisioned. 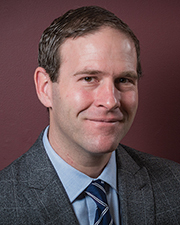 Brad Minor, MAI, is principal at Allen, Brooks & Minor, Inc., South Burlington, VT.